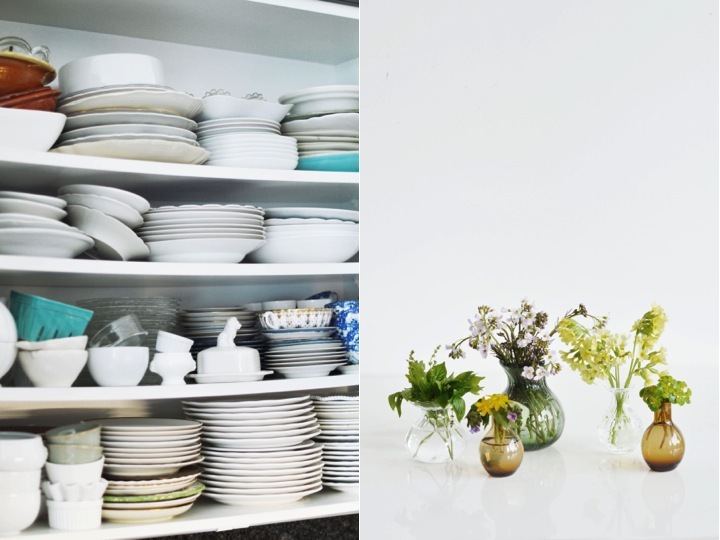 do you remember the nervous breakdown day, induced by a pile of treasured, vintage plates…? it was bad. well, since, i’ve stocked up on new and old plates, and i’ve also received a couple (probably as a result of my not so subtle whining… ahem). well, i thought i’d let you into my kitchen. this is the mess that is my kitchen cabinet. yes, it bends. shh! it won’t break (i’m not a catholic, but every time i look at this cabinet, i mentally cross myself… and send a little prayer to heaven that it will, indeed, never, ever break, amen). uh, and it’s, of course, only a tiny fraction. you haven’t seen my other cabinets. and the commode in the dining room. and my cellar. oh, the cellar. you’ll most likely never see it. because… mainly because it’s crammed. it makes me look like i’m a messy. which i’m not really. i just like me a well equipped home, alrighty? many of my favorite things start with the letter “a”. avocados, aubergines and artichokes. coincidence? to me it feels like the three of them come with an endless flow of inspiration, and an infinite collection of possible creations. 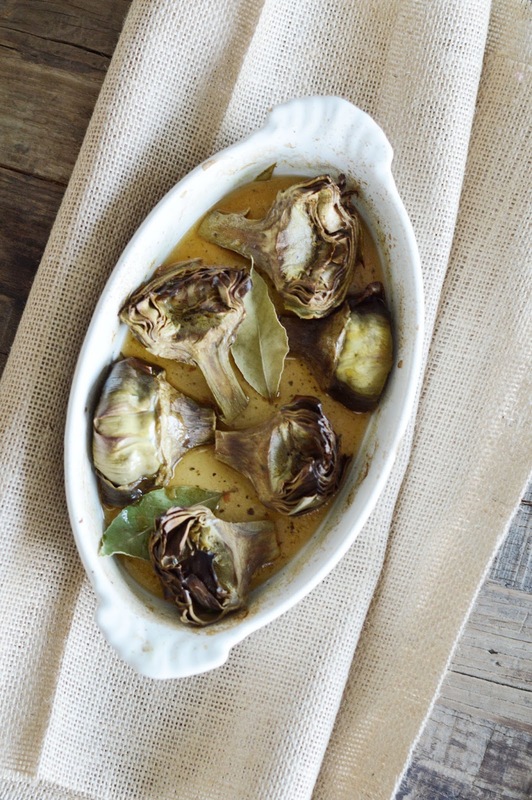 take artichokes. i’ve braised them, fried them, boiled them, confitted (?) them, stuffed them, sauteed them and roasted them. i’ve used them in salads. i’ve even eaten them raw. god only knows, i’ve even turned them into a dip. now, on to some more roasting – because it’s the simplest version there is. just toss with some good things (confession: i looove noilly prat… so good) and put in the oven until tender. 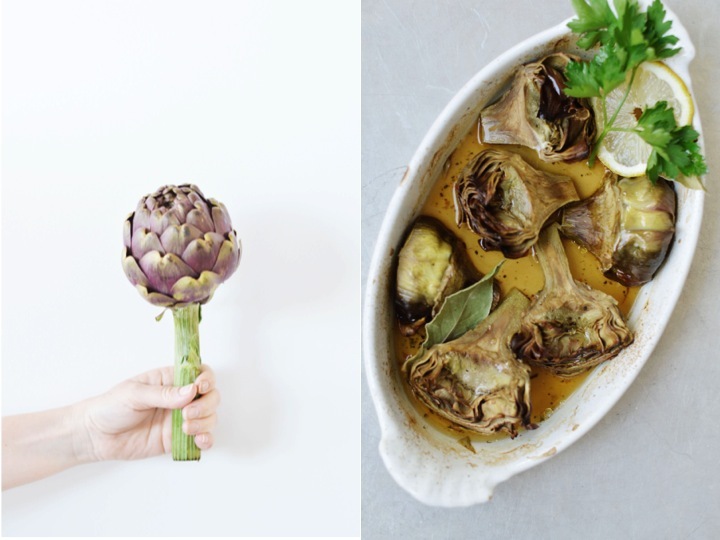 prep the artichokes: remove the sturdy outer leaves and stems. cut into halves, then remove the inner “hay” (i suggest, as always, you wear gloves for the job, although i know some people like their hands to resemble that of a cole miner… not that that’s a bad thing). immediately submerge into acidic lemon water. 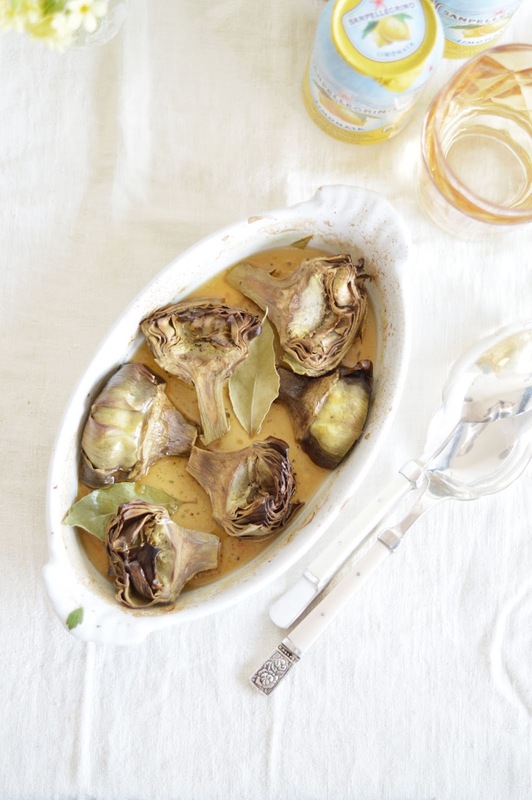 place the artichokes quarters into an oven proof pan, add the noilly prat (generous amount, right? but don’t worry, it will taste lovely! ), broth and bay leaves. season with salt and pepper. drizzle with olive oil. roast at 220c / 430f for about 25 minutes or until the artichokes are tender. Hello dear Scarlett, ahhh….what a treat to have time to come back to your blog finally. Oh my eyes…. 🙂 Of course I always see some sneak-peak over facebook, but I never get to see all the fantastic, lovely pictures in all their beauty! *sigh* I am also not able to comment from my Mac at home, commenting on blogger platforms just works from PC somehow, therefore I am writing you from work…hahha…psstttt!